Julie Roberts, Regional Manager. Siobhán O'Connor, Regional Winner and Bríd Gould, Managing Director of Comfort Keepers. 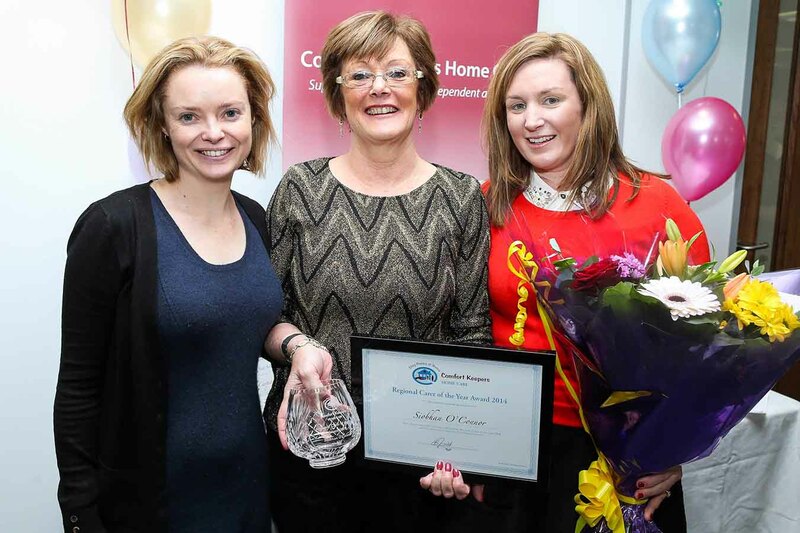 Wicklow’s Siobhan O’Connor has been crowned Comfort Keepers’ top care giver in the entire Wicklow region. The award was made in recognition of her work with older people in Wicklow and saw her ranked highest among Comfort Keepers in the region. This is the second year of the Comfort Keepers Home Care Awards which was started to recognise the extraordinary work of carers. Comfort Keepers has been helping older people and people with disabilities to live their lives as fully at home for as long possible in Wicklow since 2010. The nominations process for carer of the year began in April with client satisfaction surveys. Those surveys were sent out to all clients and they were given the option to nominate a carer. 17 carers representing 17 teams from around the country were selected and awarded local carer of the year. “These 17 men and women represent all that is good about homecare in Ireland, they are exceptional individuals”, said Brid Gould. From the 17 local winners, 4 regional carers of the year were selected with Siobhan being crowned Regional Carer of the Year for Wicklow. Comfort Keepers has been helping people in Ireland stay comfortable in their own homes since 2005 and right from the outset, has sought to ensure Q Mark, ISO9001, and Healthmark as a standard. “We congratulate Siobhan and wish her all the best for the coming year”, said Brid Gould.